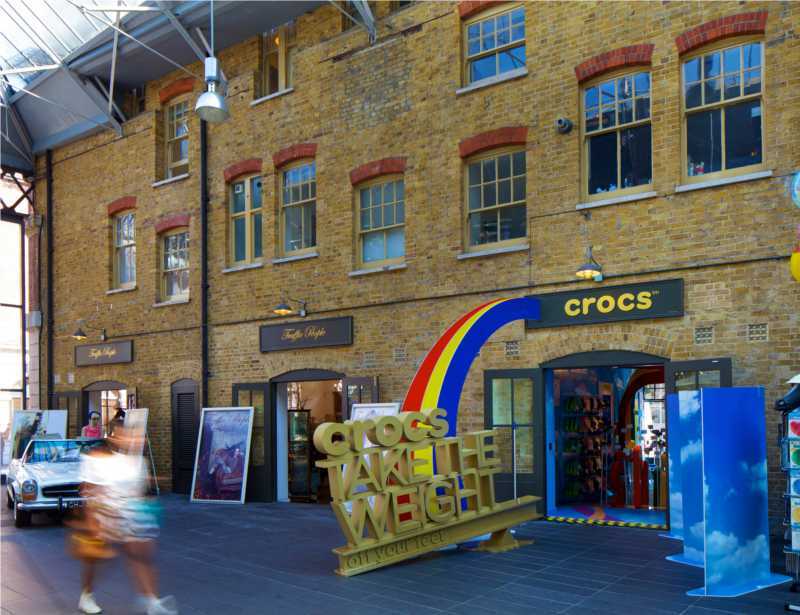 No stranger to developing award-winning pop-up stores in the heart of London, Triplar knew that a brief from footwear brand Crocs would be a fantastic opportunity to produce an exciting temporary retail space during the Olympic summer of 2012. 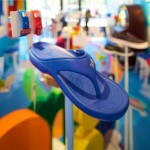 Crocs had a strong idea of how its ‘Croc-Up’ would form part of a wider campaign to highlight the brand’s strengths and change perceptions of its footwear range during its 10th anniversary year. 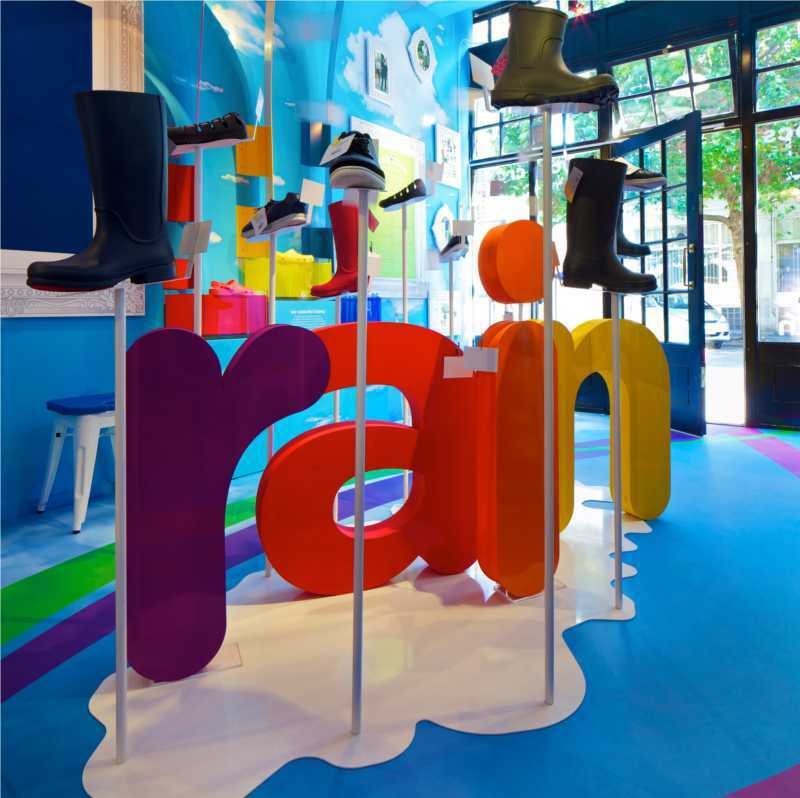 It approached Triplar in late spring 2012 with an open brief to design, locate and build the store ahead of the Olympic Games opening in the capital at the end of July. 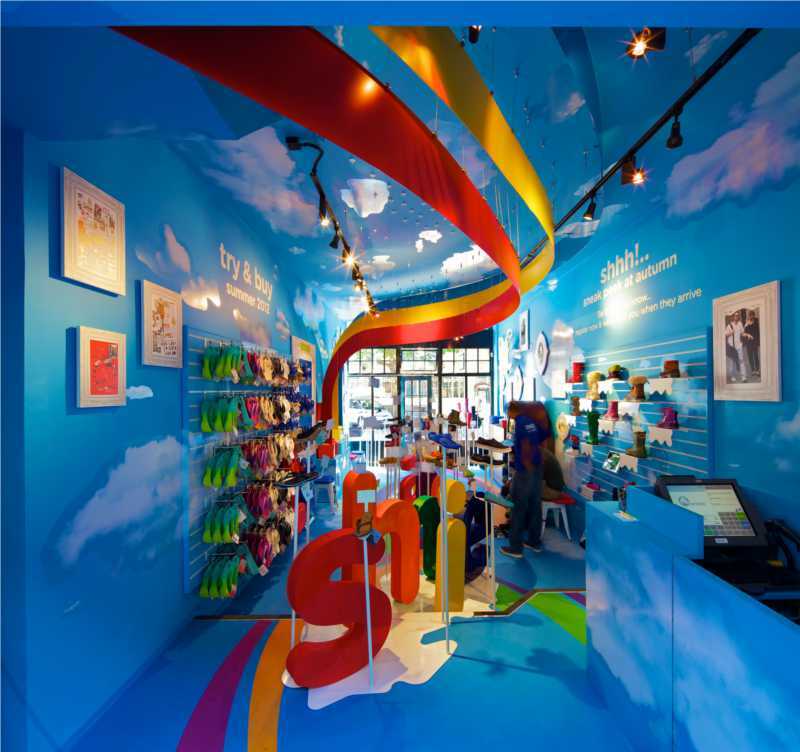 Triplar immediately drew on its network of partners to begin design work for the store by suggesting leading design consultancy Beyond came into the fold. With the creative work underway, Triplar immediately began the search for a suitable location with the help of property consultancy twentyretail. Fighting against a tight deadline, Triplar worked with Beyond and Crocs to develop a design that encapsulated the brand’s vision; brainstorming creative ideas and arriving at a striking visual concept that would reference the great British summer in a light-hearted way. 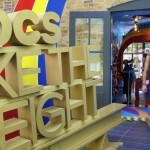 Conceived to highlight Crocs’ range within the concept of ‘Come rain or shine’, the fashion brand’s values of lightness, comfort, colour and fun inspire the interior, which is enhanced with features such as a brand history wall and ‘The Duke of Spitalfields Water Bar’ to refresh thirsty customers. 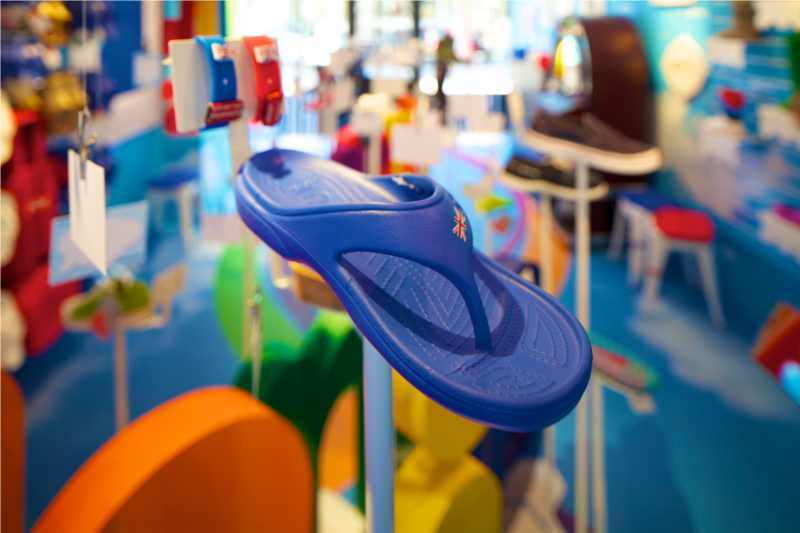 Visitors also get an opportunity to “try before buying” shoes from the Crocs range, as well as a chance to preview the brand’s Autumn collection. 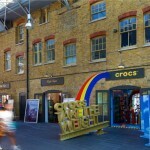 After an intensive search of Central London locations an empty unit was finally found in Old Spitalfields Market. 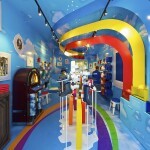 The location is familiar to Triplar, as the company constructed an award-winning and critically-acclaimed pop-up store there for Dr. Martens in 2009. 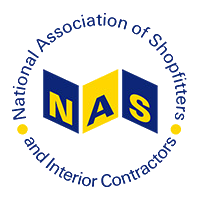 The winner of a Retail Week Interiors Awards, it went on to outlive its temporary lifespan to stay in place for over a year, finally being replaced by a permanent inline store that Triplar also built in autumn 2011. 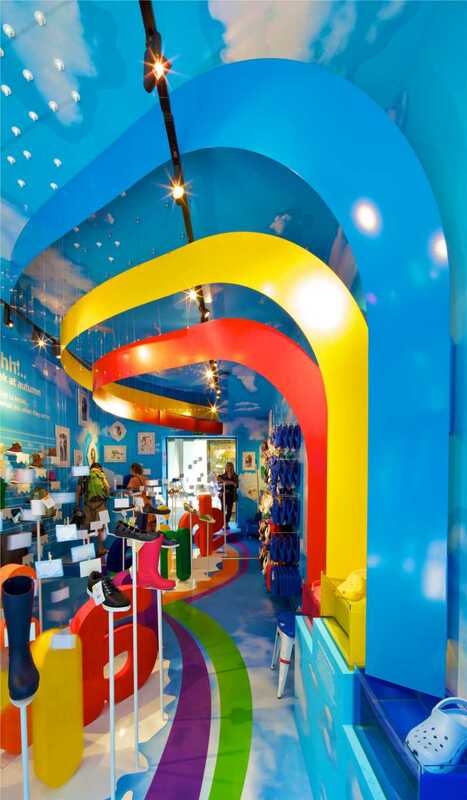 Constructed from a variety of materials, the Croc-Up includes an ever present rainbow that invites customers into the entrance before continuing through the store. 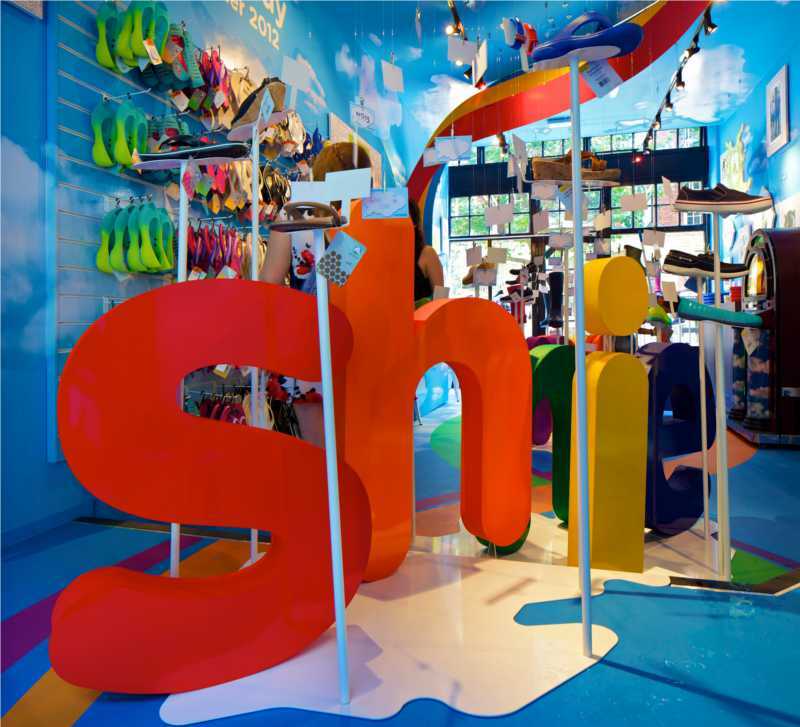 Large 3D signage also draws shoppers in and is echoed in-store as shoes are displayed on steel pedestals rising from block ‘Rain’ and ‘Shine’ lettering. 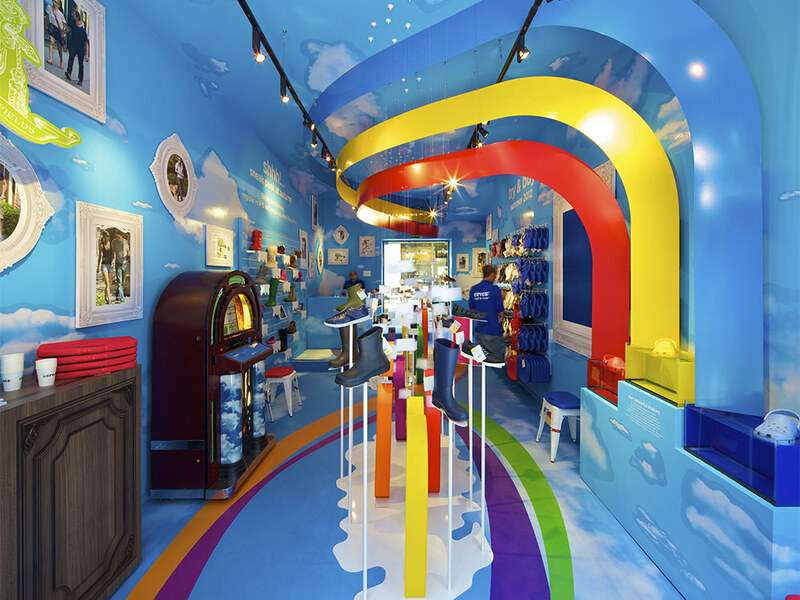 A juke box, as well as a vintage style bar and mobile cash desk complete the line-up of furniture in-store. Costs were kept down throughout by using printed vinyl to decorate the floor, walls and displays. The tight timeframe for the project meant Triplar had just ten days on site and to manufacture and install all fittings. 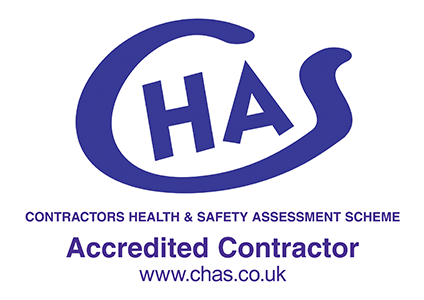 Firstly electrics and lighting had to be updated and brought in-line with current regulations, with the installation of a new mains board, sockets and spot lights. 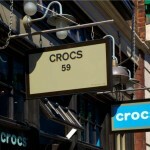 The 28 m2 store was then populated with metalwork fittings and wooden furniture. Two wall bays were installed to each wall of the rectangular space that held folded aluminium shelves in the shape of clouds with white powder coated prongs. The mid-floor and window displays were also formed from aluminium, laser cut to the shape of clouds. The ‘Rain’ feature was folded over the step to create more merchandising space and shoe stalks were then mechanically fixed to the base. 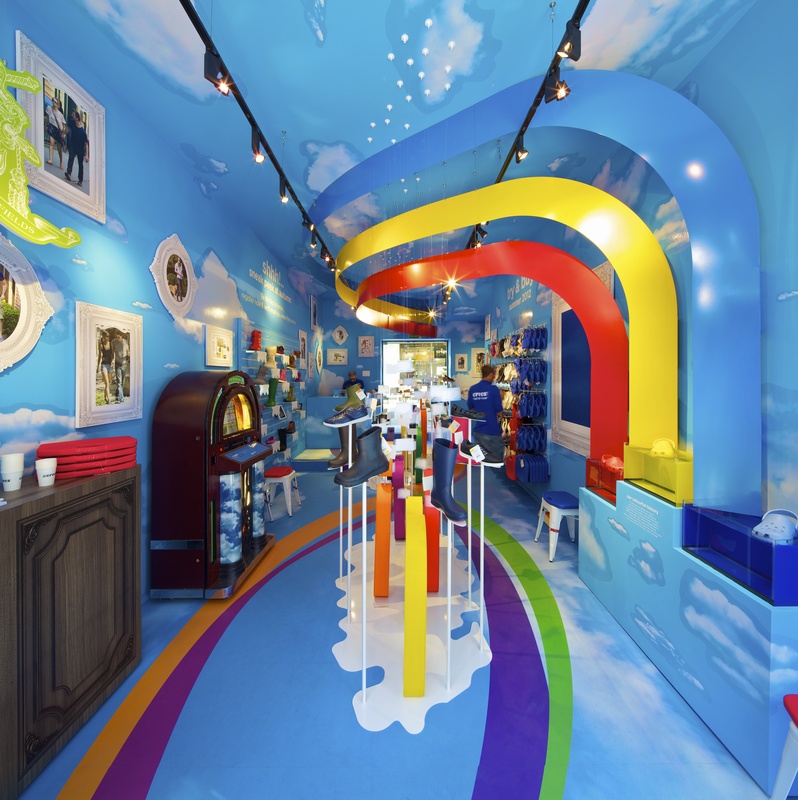 The rainbow feature was constructed and installed within just four days, after a signage contractor initially engaged to produce the fitting backed out. The Triplar team was also faced with the challenges of an increasingly busy city in the run-up to the Olympics, and restrictions that meant construction on-site could only take place between 7am and 8pm each day. 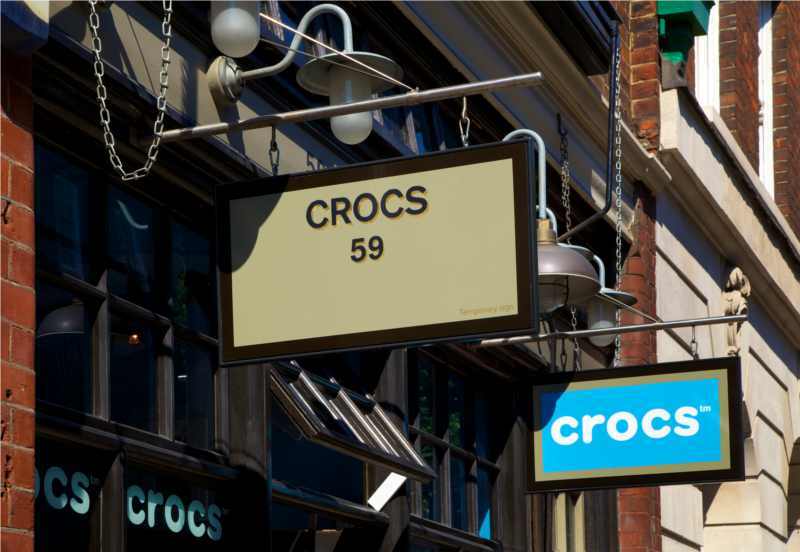 But despite these challenges, the store opened on-time and to budget, co-ordinating with Crocs’ wider marketing campaign in the capital and crowning a successful process for Triplar. 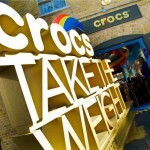 Michael Marshall-Clarke, Crocs European Marketing Director said: “Our ‘Croc-Up’ store gives us a unique way to communicate our core values of lightness, colour and fun as well as showcasing our great new range of lifestyle footwear. 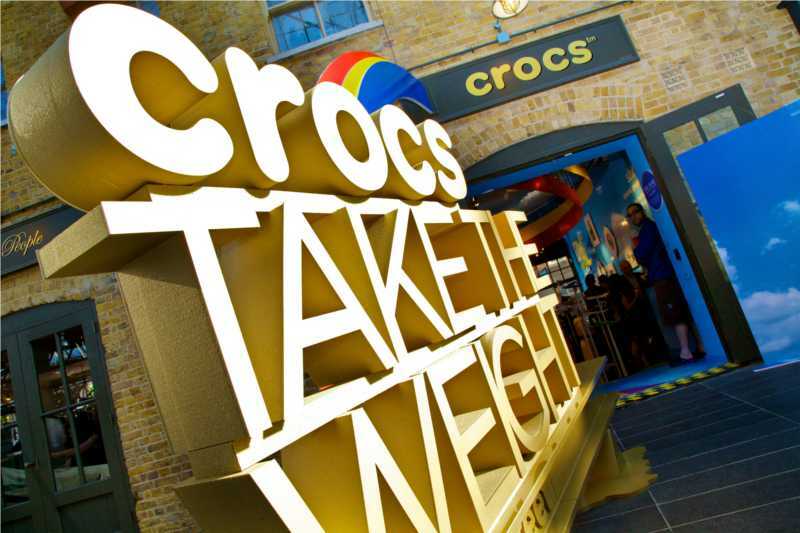 It is a unique brand experience space, giving us an engaging way to encourage consumers to take a fresh look at Crocs and join our evolution.